This scribble was published on Tuesday, August 10th, 2010. You can follow any banter on this scribble with the RSS 2.0 feed. You can share your inspired musings after typing the anti spam word near the bottom of the page. But no Pinging because its too naughty. I’m not sure how much will really change though. It’ll be interesting to see if how long people want to stay there or if they’ll nip in, feel virtuous and then disappear off to a detached residence in the burbs, having done their bit for the social revolution. 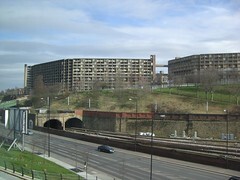 My family were moved out of Old Trafford and Hulme for the corporation to knock down the old terraces to build the new slums, very much in the spirit of Park Hill. Two differences between this model and Urban Splash’s new schemes: building quality (entire walls literally hung on with one long coach-bolt in Hulme) and concierge services for flats complexes.